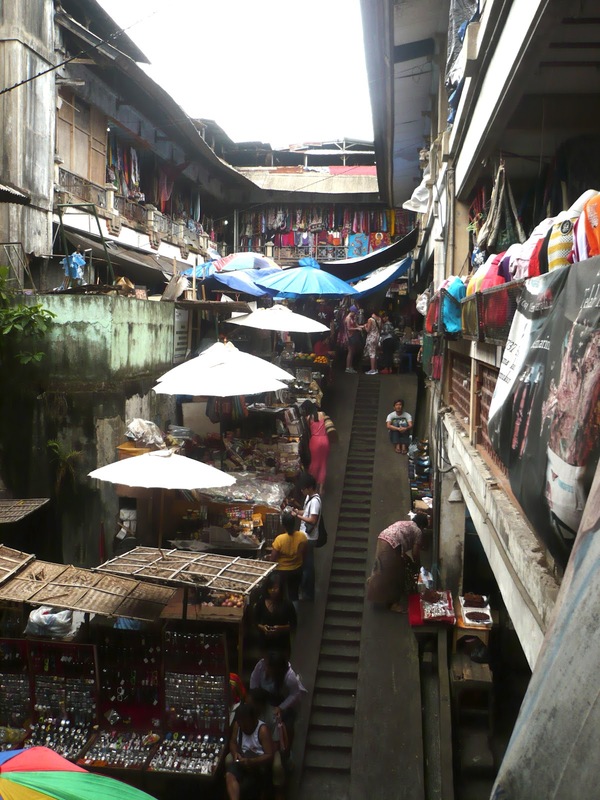 I have now been back from Bali for 2 weeks and finally get myself together to start telling you a bit about it! 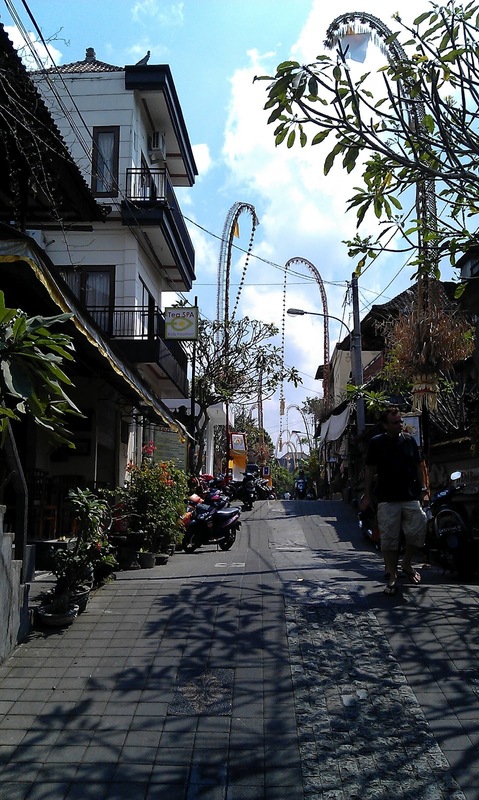 It all started in Ubud, where I ended up spending a large part of my stay. Ubud is considered the cultural centre of Bali, where artists, dancers and healers live together. 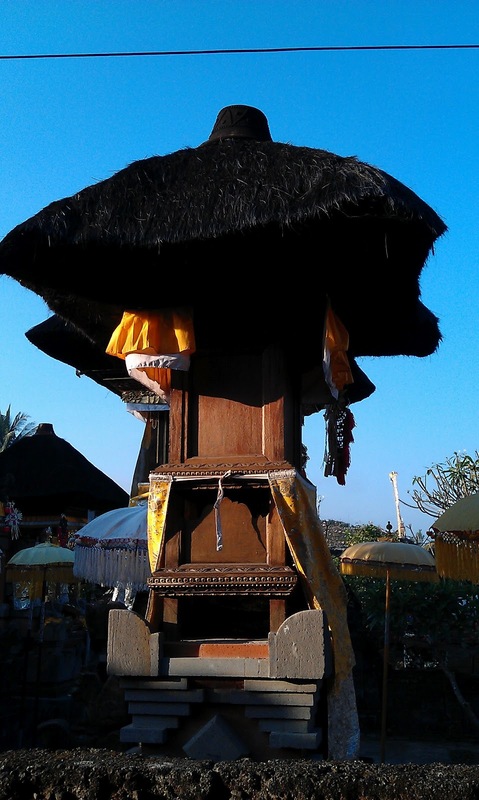 It is quite touristy but still seems to remain true to itself and the Balinese culture is definitely not lost. 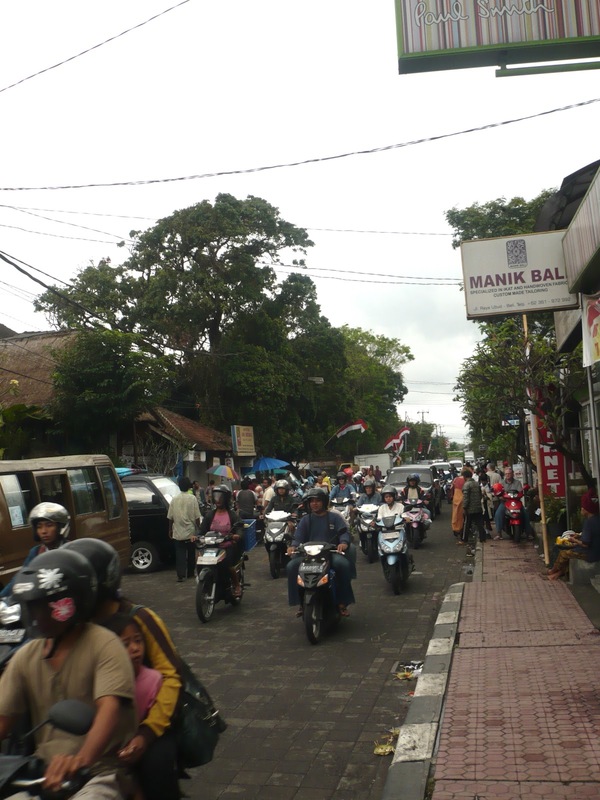 Bali is the one island in Indonesia to be Hindu ( everywhere else being muslim). And they surely are dedicated to their gods. Daily offerings are prepared using natural leaves and flowers, incense and rice to worship the gods and protect their homes and shops. 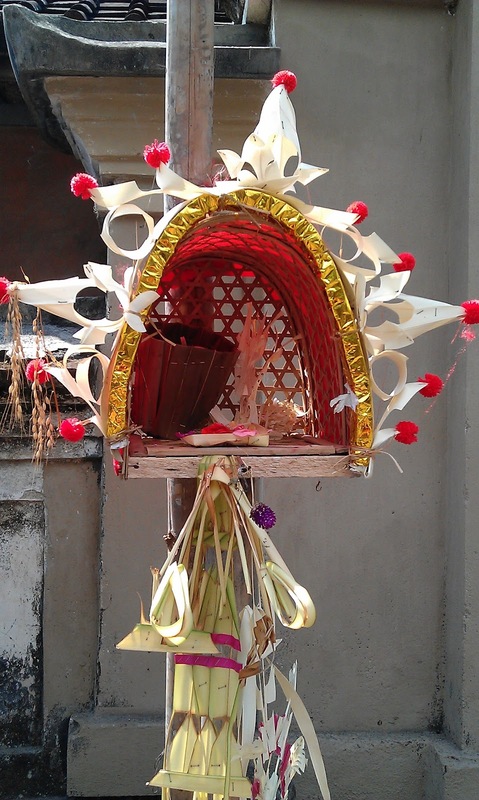 Get up early and wander the streets of Ubud and you'll see the Balinese gracefully place their offerings. There are many celebrations in the Balinese calendar and I was there just for Galangan, celebrating the ancestors's spirits coming back to earth for 10 days. At the end of the 10 days, this is Kuningan, saying goodbye to the ancestors. This celebration occurs twice a year and is a pretty big one. 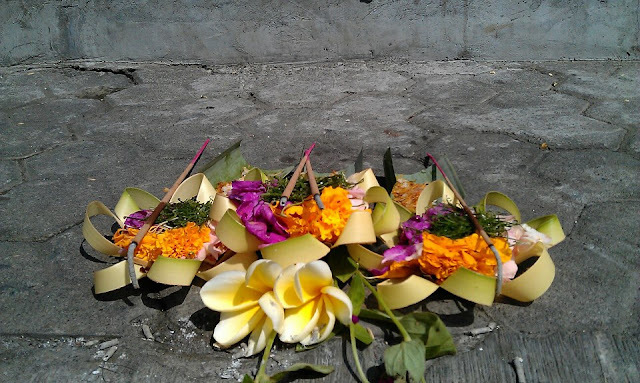 Balinese people spend a lot of time preparing decoration for their house, their temple, their streets. It is rather beautiful and I was lucky to see it! But I was also there to do yoga and eat raw food, so on I went to Yogabarn to enjoy a class in a studio half open to the outside. Simply feeling the heat felt like heaven! And nothing like a good sweaty class to get rid of jet lag (or at least diminish it..). 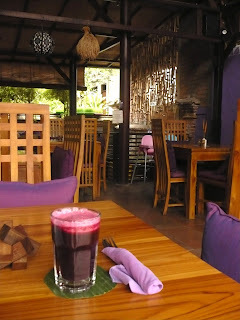 Now the great joy of this beautiful studio is that you can have lunch straight after your class, with a wide range of raw and cooked vegetarian and vegan food, de-li-cious drinks- my favorite being a mix of aloe vera, lime and natural soda. I definitely recommend it. Nothing better to feel regenerated! The first few days were full of discoveries, trying to get to know the place, find my feet by myself, contemplate the mixture of challenge and joy of traveling alone, and simply just to BE. 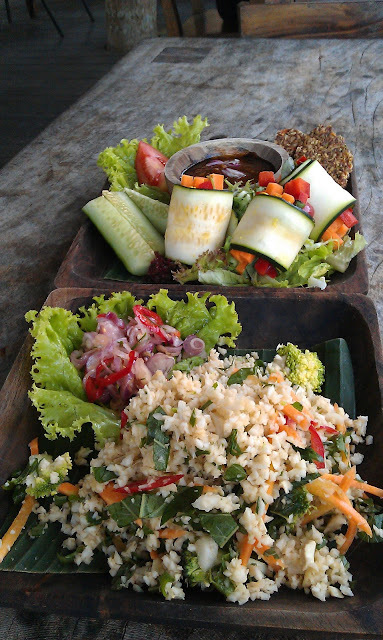 Organic Nasi Campur at Sari Organik- Ubud- Fried Tempeh, Green beans and carrots with coconut, veggie fritter, tofu curry, sambal, red rice. 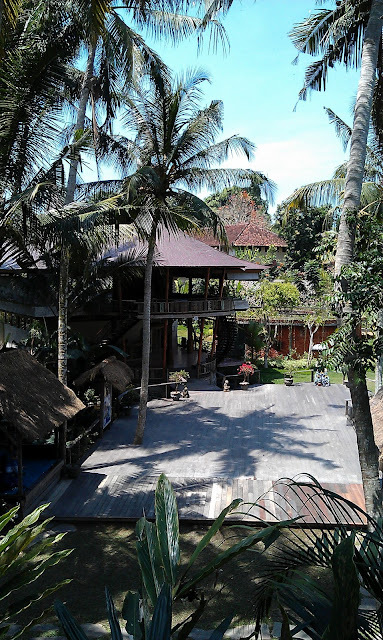 A beautiful place amongst the rice fields Sari Organik, organic farm and warung (little restaurant). Definitely worth a little walk to get there!